Join local artist Sandra Peck for a really enjoyable, relaxed and informative day. It doesn’t matter whether you are a beginner or have been painting for a while. You will have a chance to sit up close and watch detailed demonstration and then have a go yourself, at your own pace, with help as you need it throughout the day. 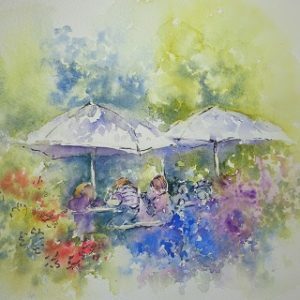 Follow a step-by-step demonstration to paint a summer scene of umbrellas in the outdoor garden cafe in loose watercolour.